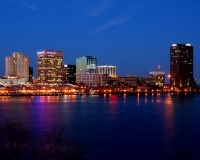 Norfolk is Virginia's second-most populated city with more than 245,000 residents and is bordered by the grand Elizabeth River and historical Chesapeake Bay. Home to the largest Navy Base in the world and aptly referred to as the 'navy capital,' Norfolk makes for a great break away and sees many visitors year after year return to enjoy this seaside destination. Its waterfront location makes Norfolk a pleasure for those who value seaside splendour. Offering much in the way of maritime attractions, Norfolk makes for a good break away in the sun and offers much more than just a beautiful shoreline. Norfolk is also home to a lively arts community, boasting some top notch galleries, museums and an impressive opera house. Visitors often marvel at the unique attractions found in Norfolk. Not only home to the Naval base where visitors can enjoy guided tours and learn about Naval life, visitors can also take some time out to enjoy the likes of the Waterside Festival Marketplace. Overlooking the Elizabeth River, those who pop by can find live entertainment, an attractive array of dining options and superb shopping opportunities. Tourists of the region can also wander through the historic district of Ghent and discover old-world Norfolk as it once was. The downtown area is also a favourite; having flourished over the years it makes for a memorable visit. Also known as a budget-friendly destination, visitors of Norfolk will no doubt enjoy what the region has to offer, and will save a couple of dollars in the process. We are looking for contributors for our Norfolk travel guide. If you are a local, a regular traveller to Norfolk or a travel professional with time to contribute and answer occasional forum questions, please contact us.